Will the Kavanaugh Saga Leave Bruises That Heal Or Permanent Scars? 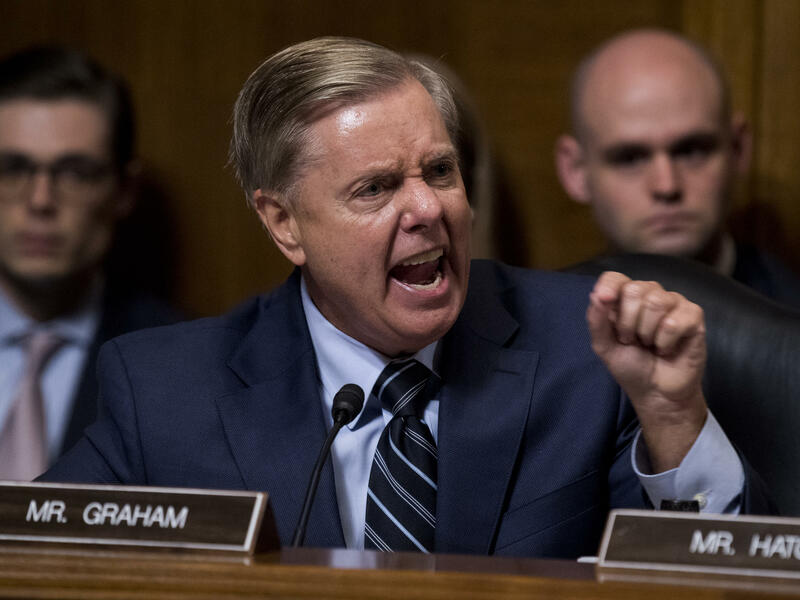 Sen. Lindsey Graham, R-S.C., points at Democrats as he defends Supreme Court nominee Brett Kavanaugh at the Senate Judiciary Committee hearing last week. President Trump's choice of Brett Kavanaugh is already the most contentious nomination to the Supreme Court since Clarence Thomas won a 52-48 confirmation vote in 1991. Thomas' was the closest vote confirming a justice since the 1800s, and it followed a stormy hearing and an adverse vote in the Senate Judiciary Committee. The process nearly foundered on accusations of sexual harassment and racial prejudice. But the Senate in that day settled down, and Thomas has served on the court for 27 years – a nearly always silent anchor on the court's right. The Kavanaugh controversy did not have a racial element, but at times has seemed equally bruising. It has divided the Senate just as evenly. And it may prove to be more permanently divisive, not only for the Senate's confirmation process but for the Senate itself and for the Court as well. It must be said that the atmosphere of collegiality has been deteriorating in both institutions for some time. But the Kavanaugh confrontation has featured more raw partisanship on all sides than even the Thomas affair. "Boy, you all want power," said Sen. Lindsey Graham of South Carolina, his voice rising to a shout at the Democrats across from him in a public hearing. "God, I hope you never get it!" That came from a Republican who had twice voted to confirm Democratic nominees for the Supreme Court and who was once considered something of a bridge between the parties. It is one more manifestation of the emotional cauldron that boiled throughout the 2016 presidential campaign and has simmered ever since. And it may poison relationships in the Capitol and the Courthouse for some time to come. By tradition, both the Senate and the Supreme Court have been thought of as elevated plateaus in American political life. In these hallowed spaces, the air was rarefied. Party ties existed but mattered less. Ideology was present and contentious, but it was not always salient. Much if not most of the time, differences were expressed and explored in a calm atmosphere. A belief in tradition and the power of compromise prevailed. Perhaps this memory owes much to myth. Nations, like people, are inclined to idealize and sanitize their pasts. Some, too, may be attributable to the lower profile of both Senate and Court in the generations before C-SPAN, cable TV news and social media. But there surely has existed a keen sense that being the Senate — and acting accordingly — mattered for its own sake. Some of this can be seen in the courtly way senators address each other in the chamber even now. They do not use names but refer to each other as "the distinguished" gentleman or "gentle lady" or as the senator from such and such state. What is said in the cloakroom, or behind closed doors, does not get repeated on the Senate floor. The ambience of this more bipartisan Senate was on display last month in the tributes to the late Senator John McCain of Arizona, a Republican to be sure but one with many friends across the aisle. This notion of Senate decorum was visible at times in the Senate Judiciary Committee hearing a week ago, primarily in exchanges between the two most senior members of each party – a quartet that has served a combined century-and-a-half in the Senate. Even in anger they spoke to each other in a familiar, almost familial manner. Such courtliness was not shared by most of the rest of the committee on either side. When the Senate convenes to vote on Kavanaugh, which style will predominate? And when the Senate returns to business after these tense midterm elections, what atmosphere will prevail? In this conception of the Senate and Supreme Court, one often cited that old adage about politics making strange bedfellows. It was apt, and often applied to positive and productive things that happened. Relationships beyond party made possible the Civil Rights Act of 1964. The historic breakthrough relied as much on Republicans as Democrats, as the latter party's Southern "Dixiecrat" wing was adamantly opposed to the legislation. That was still the case 20 years later when Republicans and Democrats in the Senate worked together on a tax overhaul both could applaud. They overcame the more fractious folks from the House and gave President Reagan a bill he could happily sign into law. All that actually happened. The Senate in those times was scarcely a love fest, but individual Democrats and Republicans typically had friends – even really good ones — in both camps. Something like this spirit has characterized the Supreme Court, at least in the popular imagination. We had the friendship of Antonin Scalia and Ruth Bader Ginsberg, for example. Although at ideological loggerheads, they and other justices shared interests in music and art. The justices were known to spend social time together, as did their clerks. Here again, the institutions and their denizens had an interest in promoting this kinder, gentler image. It surely served their own self-concepts of superiority. But it also helped them fulfill their functions and maintain a higher degree of public respect for them and their work product. Perhaps the quickening of the pace of life, the endless siege of media attention, the coarsening of our political discourse and the deepening of divisions between the parties and the regions of the country have simply made that pleasant illusion too difficult to sustain. Surely the tensions brought out by the clash over Kavanaugh are testament to this. And not least in these considerations is the confrontation of two powerful movements – the emergent #MeToo and the ascendant Federalist Society – whose energies collided so dramatically with the testimony of Christine Blasey Ford. Friday's vote to advance Kavanaugh's nomination to its final phase falls precisely on #MeToo's birthday, the anniversary of the New York Times expose of Hollywood mogul Harvey Weinstein. In the intervening twelve months, more than a dozen men in pinnacle positions in entertainment, news and business have been toppled by credible accusations of sexual harassment, abuse or assault. Inspired by these examples, women have come forward to tell their stories in countless organizations, workplaces and institutions. But in this latest high-profile confrontation, this impressive movement collides with another that has also been enormously transformative. That is the four-decade effort to remake the federal judiciary in accordance with more conservative ideas of legal policy and constitutional interpretation. As one appeal for donations from one longtime conservative group spelled it out Thursday night: "This is the moment we've been waiting for now for half a century..."
That effort has largely been organized and driven by the Federalist Society (formally the Federalist Society for Law and Public Policy Studies), founded by law students and legal scholars at Yale and the University of Chicago in 1982. But even before the Society took form, conservatives and libertarians were talking about the need to restock the federal courts with judges who would read laws as literally as possible and not be tempted to use their power to redress perceived wrongs or bring about social change. The terms originalism and textualism came into common usage. The critique of "activist judges" had begun many years earlier, of course, after the landmark decisions of the high court under Chief Justice Earl Warren. Those included Brown vs. Board of Education, mandating desegregation of public schools, and Baker v. Carr, establishing the principle of one-person-one-vote in drawing election maps. The Warren Court also ruled against prayer in public schools and underscored the rights of criminal suspects. But perhaps the most explosive decision from the court came after a new Chief Justice, Warren Burger, took over in 1969. Appointed by President Richard Nixon, Burger was presumed to be about reversing the court's liberal drift. But in the 1973, he sided with the majority in the Roe v. Wade decision, when the court voted 7-2 to legalize abortion in all 50 states. Unlike the reaction to other Supreme Court bombshells before and since, the pushback against Roe did not subside over time. If anything, it grew. By 1980, with the election of President Ronald Reagan, opposition to Roe had become a focal point for most Republican candidates. As time passed, the party platform became ever-more definitively anti-abortion, while Republicans who favored abortion rights were increasingly rare. And the Federalist Society became a force in its own right. When President Trump was running in 2016, he repeatedly pledged to appoint only justices whose commitment to overturning Roe was clear. He campaigned on a pledge to choose only from a list of prospective nominees presented by the Federalist Society. He has since done exactly that with his appointment of Justice Neil Gorsuch (who was confirmed with all Republicans and three Democrats voting aye), and Kavanaugh. The last two previous appointees of a Republican president, John Roberts and Samuel Alito, were also Federalist Society alumni, along with 1991 appointee Clarence Thomas. So Kavanaugh would complete the court's first Federalist Society majority. The Federalist Society is about restoring a set of values from the past and defending settled arrangements. The #MeToo movement is about challenging such values and renegotiating such arrangements. Whatever happens to Kavanaugh, or the comity of this Senate and this Court, that larger struggle will be with us all for the foreseeable future.